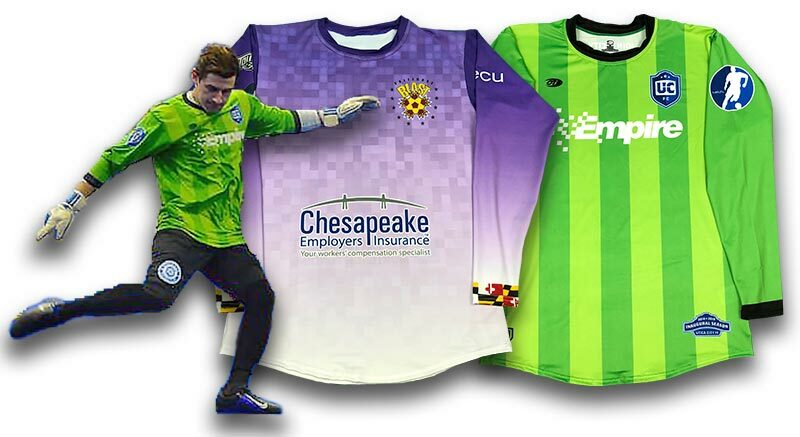 Looking for the best custom soccer uniforms and apparel? OT Sports custom uniforms are trusted by professional teams of the MASL and USL to provide the best look and performance on the pitch! High-performance four-way stretch fabric engineered to give players full range of movement and keep them dry and comfortable for the full 90 minutes of play. All designs sublimated for maximum color and durability and to keep our jerseys ultra light for player comfort. Available in crew neck or v-neck, long-sleeve or short-sleeve. Athletic cut for a custom fit. Same performance as our long-sleeve game jerseys, but in blistering colors that make your keeper stand out on the pitch. Sublimated athletic performance socks available in crew length or knee high. Full sublimation designed to match the uniform perfectly. Available in sizes X-Small, Small, Medium, Large and X-large. Allow 2-3 weeks for production. Innovative light and breathable, yet warm, performance fleece provides all-weather comfort. Perfect for practice, pre- and post-game and team travel. Crisp sublimated designs provide excellent detail in team crests, logos and other graphics and maintain their look for the life of the garment.